It's a brand new week and I hope it will be more interesting with all things Arsenal than last week was. Very little came out of Arsenal in the way of news last week so most media resorted to dishing out the mundane, the unremarkable and the humdrum to fill the pages. May this week see us living in interesting times. Pre-season training resumed last week Monday with most of the first team reporting for duty. 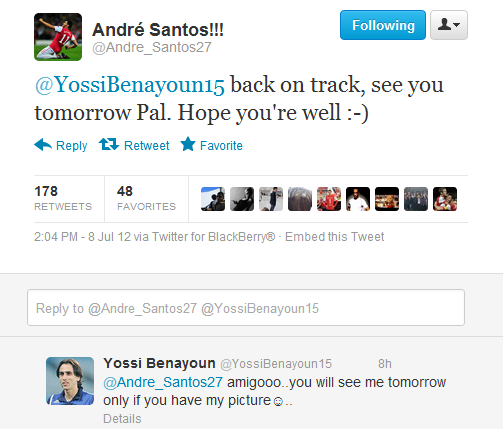 Seemed no one told Andre Santos that his pal Benayoun was on loan last term and has had to go back to his owner. He sent the twit below to Benayoun the day before pre-season resumed and got a cocky response from Benayoun. While this provided comic relief during a mundane spell as regards darling Arsenal FC, I did pause to wonder why there was this gap in communication. Were there no goodbyes said before the team broke up at the end of last season? Players use Twitter to communicate these days so I assume they must all have Arsenal.com domain emails through which management communicates all sorts like any normal cooperate organisation. Talking of Twitter, Emmanuel Frimpong put his foot mouth in it again yesterday when he responded to a Spurs fan who responded to his Twit "If you are going to church pray for me, giving today a miss" with "I pray you break your arms and legs". Frimpong responded with "@Scum Yid" sparking a racism claim by mostly Spurs fans. Yid is a derogatory term for Jews. Even though Spurs fans refer to themselves as the Yid Army on account of the massive support they enjoy from the Jewish community in North London, they take exception to being referred to as Yids by Arsenal fans. Like when black people call themselves Niggas but get all heated up when a white man calls them that. Hysterical, innit? Over the weekend, Arsenal took part in and won the 2nd edition of the Markus Liebherr cup which is held in honour of former Southampton owner of same name. Hosted by Southampton, the two 45 minutes match competition is a round robin type and involved Southampton FC, Anderlecht and Arsenal. Arsenal won the first match 1-0 against Anderlecht and though they lost the second match 5-4 on penalties to Southampton, they amassed enough points to be declared winner. Hurray! A trophy in the cabinet at last. Gervinoh's 35th minute equalizer was reminiscent of that famous Kanu goal against Chelsea but didn't quite manage to trump Kanu's but it still was a beaut. Here's hoping that's just a tinny bit of what he has in store for us in the 2012/13 season. After tantalizing us on arrival with a goal like that during pre-season he had failed to live up to expectations. On the transfer front, it's been largely quiet with mostly the kind of rumours that are designed to sell papers making the rounds; RVP to Man City in exchange for Dzeko plus cash, Chelsea and Liverpool ready to do battle for Walcott, Barcelona to sign Koscielny. RVP is due back this week, I assume to continue house hunting in whatever Borough he'll call home next season. I really couldn't be bothered with continuing to dignify all the conjecturing going on as regards his future. Theo Walcott's contract still remains a loose end and I do hope that's sorted out this week with hope that he stays with us. Not because I believe he's worth his salt but I really don't want to hear all the negativity from friends and foes alike if we lose him in addition to Van Persie. I also think it will do a lot of damage to the collective morale of the squad. RVP's announcement penultimate week, succeeded in eclipsing any positives in our transfer dealings. M'villa, Capoue (no relation of Eboue's) and Lloris were some of the main pursuits whose talk seems to have cooled since then. I hope this week brings forth not just rumours but club announcements of at least one more new signing. Like I said in the beginning, these are uninteresting times but I am obliged to serve you a delectable meal on a daily. Do bear with me when it's served cold.